Asian beauty products are becoming increasingly popular over here. I've been testing out quite a few different items recently & have completely fallen in love with cushion foundations. Brands like L'Oreal & Lancome have helped them to become more accessible in the UK. I really like the L'Oreal one but it still pales in comparison to a proper Korean cushion foundation. The main difference is that the Korean ones are refillable & it costs much less to refill a cushion than to buy a new one. They also aren't just a foundation, they have many different skincare benefits too. My current favourite is the Innisfree Ampoule Intense Cushion. This foundation is incredibly moisturising & really gives you that dewy skin look that is so popular in Korea. This cushion would be ideal for those with dry or dehydrated acne-prone skin. I have it in shade #13 & it's a perfect match for my skin colour. It provides light to medium coverage that still covers blemishes & scarring. It looks so natural on the skin whilst giving a poreless, flawless finish. The sponge blends everything out really well & application takes no time at all. This would be such a good base for the summertime as it feels so light on the skin & the compact is ideal for touching up throughout the day. I always end up calling this brand Sum 41 for some reason but Su:m37 is actually a premium beauty brand from Korea that specialises in naturally fermented skincare. I am obsessed with their Miracle Rose Cleansing Stick! The name reminds me of a Sailor Moon weapon but this is one of the best cleansers I've ever tried. This cleanser is unique in that it's a twist up coconut oil-based stick infused with many essential oils & fermented damask rose extract. It also contains real rose petals which has to be to most luxurious way to gently exfoliate your skin. You just rub the stick over damp skin & it will delicately lather up before melting away any impurities. I use it by itself in the morning & as a second cleanser at night after removing my makeup. It is so hydrating, so gentle & would be ideal for all skin types. 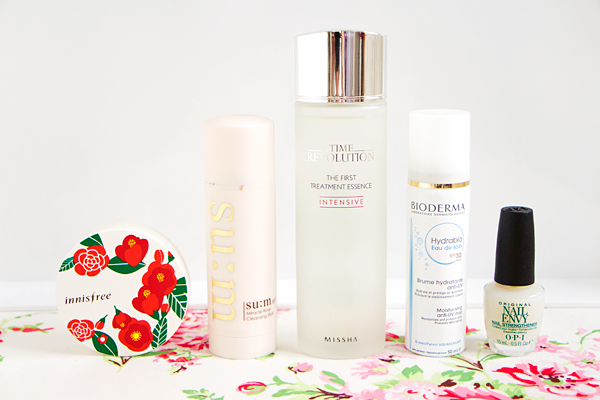 The last Korean beauty product that I've been loving this month is Missha's First Treatment Essence. This hydrating water is legendary amongst Asian beauty fanatics as it is essentially a dupe for SK-II's Facial Treatment Essence. The SK-II version will set you back £115 whereas you can get the Missha FTE on eBay for about 20 quid! The main purpose of essences is to prep your face for other products. I normally use it after my chemical exfoliant & hydrating toner but before any serums or moisturisers. This helps anything I put on my skin afterwards to be more effective. I usually put about four drops on my hands & then gently pat it into my face. It feels just like water & is very refreshing. What makes this essence special is that it is enriched with 80% fermented yeast concentrate & niacinamide along with lots of other great skincare actives. The ingredients have many soothing, moisturising, brightening & anti-ageing properties. Since I started using this product my skin has felt better hydrated & looks a lot brighter. It works really well on redness & gives me a much more even looking complexion. Definitely check this out if glowing, softer, clearer skin is something you desire. Facial sun protection is something that I use every single day, come rain or shine. However I am slightly guilty of not applying it correctly. I always slather the stuff on in the morning but I never reapply it during the day. There's just no easy way to do it without removing all of your makeup at the same time. That was until Bioderma came out with this amazing sun protection spray. You simply mist it on your face & your skin will be fully protected from the sun without ruining your makeup. It just feels like a hydrating facial water & it doesn't sting my eyes or disturb my makeup in any way. You still need to apply a normal sunscreen in the morning but this spray will allow you to keep topping up with SPF 30 whilst still looking fully glam. My nails always grow really long without any effort on my part. However they also always break off or split so I finally decided to do something about it. I have put off buying OPI Nail Envy for years! I'd heard so many good things about it but the £18 price tag always put me off. I ended up buying it off eBay in a set with OPI Avoplex cuticle oil for just £15.99 & I'm so glad I did! My nails feel so much stronger now & I love how shiny it makes them look without proper nail polish. I do sometimes forget to apply it every other day but my nails are still reaping the benefits so it's clearly working for me. Avoplex is also pretty awesome & it has replaced my beloved Essie Apricot Oil as my cuticle treatment of choice. I love massaging it into my fingertips as it keeps everything looking smooth & healthy.